Needs some trimming to fly straight. After several years of searching for a kite that is capable of flying on even the lightest of breezes, I have finally found it! 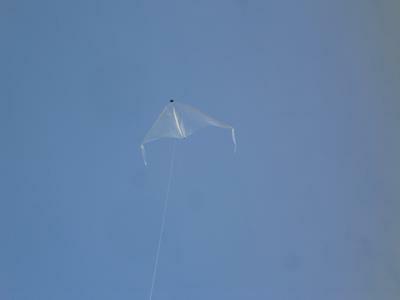 The MBK Dowel Delta was soaring at nearly 500 feet in a very light breeze! Once again, the build was a fairly easy 3 hour project. There was one occasion where I misread the plans while cutting the plastic sheet. This goof left me with a 33 1/2 inch sail from top to bottom. I think we all know the adage - "measure once, cut twice." Oops, I think it's actually "measure twice, cut once." This time, I followed the plans when it came to spar thickness. However, I left out the doubler on the spreader. The flying weight was just 3.5 oz. 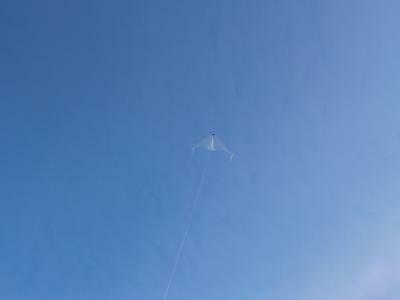 It is an outstanding kite for those of you who want to build on the tightest budget imaginable! I have a grand total of $2.07 worth of dowels! The rest was stuff I already had. Today was the first flight of my MBK Dowel Delta kite! It flew very nicely up to about 470 feet AGL at a 70 degree angle! I don't think the FAA would've liked that, but I was keeping a sharp eye out for any air traffic that could be an issue. I did find that it needed some extra drag to keep it from gliding into the wind. One tail on each wing tip helped quite a bit. Also, I can trim these tails to fix a droopy wing. I was also pleasantly surprised by the light pull on my reel. Since most of my flying is at the beach, I spend a lot of effort making sure nobody can get hit by the wreckage when my kite breaks and falls to the ground. It was a nice change of pace being able to set the reel on the grass and play catch with my son. Seeing as how nothing really bad happened other than having to bring the kite down and go home for dinner, I don't think there is much else to say about this kite. Although I am VERY pleased with this light wind kite, I will bring a lawn chair next time so I don't get a stiff neck from staring straight up for most of the flight! Comments for A Dowel-Delta-Kite Success Story! Yes, Tim the spars are very abundant in the Pacific North West. In fact, Oregon is the Nations largest supplier of Douglas Fir. Sitka Spruce is not far behind as well. While these are very popular woods, I usually end up using Poplar. It's grown here in Oregon as well as China. Wal-Mart sells Chinese Poplar for 27 cents per three foot stick (1/4"). Poplar is used mostly in home construction because it grows very fast, I have even seen it used in homebuilt aircraft. I would never use poplar for that application, but that's just me. Either way, it's strong enough and very affordable. So, while they are cheap, the spars are the biggest cost in my kites, followed by the sail plastic which is about 25 cents per kite. It may be even less if I cut my sails to get the maximum use of a 9' X 12' sheet. I think the Dowel Delta cost just over $2.00 to build. If you think about the dollar-per-hour value of building and flying one of these designs, I can't think of anything at this moment that provides more FUN per dollar. Will the double dowel delta be available on your site as well? I am on a very tight budget and can't justify purchasing such a luxury. I do plan on a 200% scale delta in the future. Right now I'm toying with the lure of a Peter Lynn Box Kite made with MBK supplies. I haven't decided on either 48" span, or 72" (two X36" spars with a splice joint) I can get spars in either size for a reasonable price. My only concern is the attach points on the sails. I don't know if you are very familiar with these kites, but mine pulled waaay harder than I expected. My P.L. Box is made from high quality fabric and it has never ripped in flight or while being "forcibly disassembled" during it's big crash while trying KAP on the Oregon Coast. As far as my new design goes, I don't think plastic would hold up to the stresses it is subject to in flight. 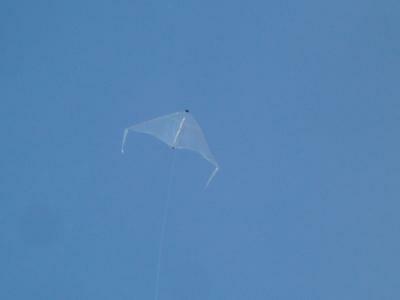 Any input on plastic sails for this type of kite would be a big help. 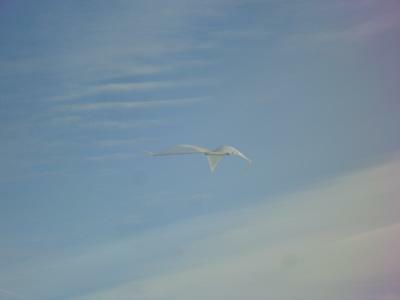 The Delta is one of my very favorite 'light wind and thermals' designs. Even the tiny 1-Skewer version does a reasonable job sometimes. In fact, on polyester sewing thread I wouldn't be surprised if the 1-Skewer Delta could make it all the way to 500 feet, in the right weather. Going to the other extreme in size, sometime this year I'll be putting out an e-book on doing a Multi-Dowel Delta. At twice the wingspan of the Dowel Delta, it should be twice the fun!